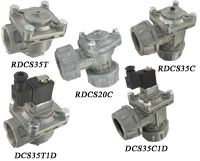 The Series DCS/RDCS Springless Dust Collection Valves are ideal for use with the Series DCT1000 and Series DCT500 duct collection timer boards. A springless design offers not only durability, but also reliability for an exceptional cleaning pulse. Both the Series DCS and RDCS have the option for either coupling or NPT connections. The coupling connection allows for a quick and simple installation. Only the stub pipe and blowtube need to be cleaned and deburred before the valve is fit into position. The “T” Series DCS has female threaded connections and the “C” Series DCS has a coupling connection. Both the “T” and “C” versions have a 90° angle between the inlet and outlet: the most suitable configuration for pulse valve applications. The valves are offered in both integrated and remote coil configurations. DCS - Direct Solenoid Mount, 3/4"
RDCS - Remote Solenoid Mount, 3/4"
DCS - Direct Solenoid Mount, 1"
RDCS - Remote Solenoid Mount, 1"
DCS - Direct Solenoid Mount, 1-1/2"
RDCS - Remote Solenoid Mount, 1-1/2"
Body: Aluminum; Diaphragm disc: Thermoplastic polyurethane; Solenoid seals: NBR. Cover: Aluminum; Body bolts: Zinc plated SS; Solenoid: Nylon. Ambient: -4 to 140°F (-20 to 60°C); Operating: -4 to 185°F (-20 to 85°C). 110 VAC, 220 VAC, or 24 VDC for DCS models. 12 W, inrush: 17 VA; Holding: 14.5 VA for DCS models. DIN connection for DCS models. NEMA 4X (IP65) for DCS models.